GOSH!ABOUT: Greece And The Hellenic Initiative – GOSH!About: Fashion. Art. Music. Events. TV. Non Profits 'N' Lifestyle > Subscribe now! 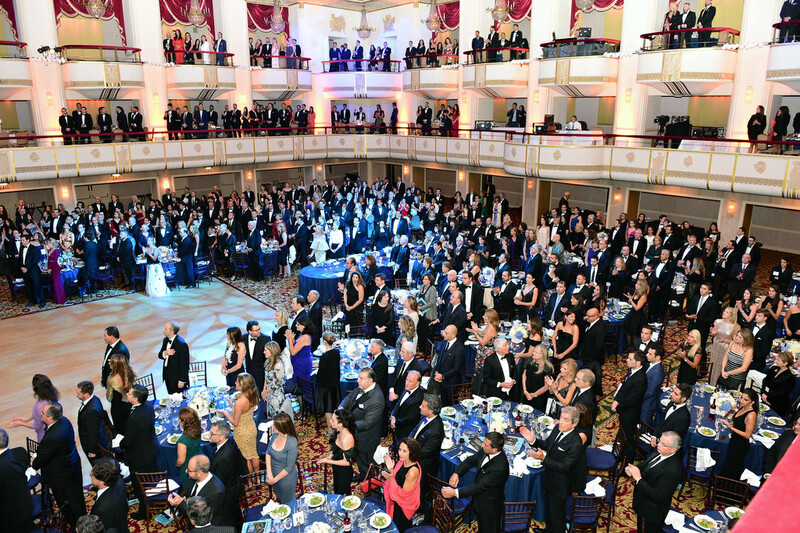 The beautiful Waldorf Astoria in New York, was a great backdrop for the fourth (4th) annual The Hellenic Initiative (THI) on September 30, 2016. A black tie event, we were served exquisite hors’d’oeuvres and fine Greek wine in the main ballroom. This event was a super success raising over $2.0 million dollars. The funds raised will be invested into entrepreneurial programs in Greece, supporting Greek NGOs who provide for under served communities in Greece, especially the children. The Hellenic Initiative is leading the Greek-American community in raising awareness, plus investment capital, for Greece. Tonight’s gala honoured outstanding individuals for their hard work and support of the Greek people. Chris Diamantopoulos, did a fabulous job of hosting and emcee the event. He’s a Greek-American actor on HBO’s Silicon Valley and is the voice of Disney’s Mickey Mouse. Keynote speaker, Admiral Jim Stavridis, a USN(Ret. ), former Supreme Allied Commander of NATO and Dean of the Fletcher School at Tufts University. Outstanding honourees were Action for Migration & Development and Together for Children; special recognition went to Re Generation, the largest private internship program for the millennial in Greece, a joint program of The Coca-Cola Company and THI (The Hellenic Initiative). Special guests appearances at the event, US Summer Olympians: Katherine Stefanie (GRE) Gold Medal, Omen’s Pole Vault; Heliosphere Petunias (GRE) Gold Medal, Mens’ Rings; Pyridine Giannini (GRE) Silver Medal, Mens’ 10 km Marathon Open Water Swimming; Helen Maurois (USA) Gold Medal, Omen’s freestyle Wrestling 53 kg. The Hellenic Initiative, founded in 2012, is a global, nonprofit, secular institution mobilizing the Greek Diaspora and Philippine community to support sustainable economic recovery and renewal for the Greek people. THI programs address crisis relief through strong nonprofit organizations; also building entrepreneurial skills in a new generation of business leaders. Fall of 2013, one in five households and nearly 600,000 children were living below the poverty line. Nearly half of all Greeks lack health insurance. THI partnered with Apostoli, the largest food relief organization in Greece, distributing food to 10,000 families per month. Their grants have provided 1.3 Million meals, supported 24 agricultural associations to access better equipment and supplied 62,797 gallons of heating fuel to 59 social welfare institutions in Northern Greece. Their grants goes to Doctors of the World-Greece, which helped vaccinated 10,000 children against a number of diseases, provided primary and secondary dental treatments to over 13,000 individuals, and provided free examinations to nearly 1,200 women. Funds also go to Muscular Dystrophy Association Hellas (MDA Hellas) , providing vital services to thousands of people in Greece suffering from 47 rare neuromuscular disorders.